On May 11, 1997, a chess-playing computer, Deep Blue, and world chess champion Garry Kasparov were on their sixth and final game. His rematch after the previous year was all square, with one win for each side and three ties each. After just an hour, Deep Blue won the deciding game. Commentaries on the meaning of the machine's victory were riddled with emotional angst and anxiety, prompting Bart Ziegler in the Wall Street Journal to summarize the national reaction by asking: "One small step for a computer, one giant leap backward for mankind?" IBM, the creator of Deep Blue, carefully documented the coverage of that fateful chess match, compiling several binders of press clippings and editorial comics. The company later donated these to the museum, along with the famed computer itself. Looking back at those initial reactions 20 years later, does the angst seem justified and have similar anxieties been sparked by subsequent computer advancements? In 1965 Intel cofounder Gordon Moore predicted that the number of transistors on an integrated circuit would double approximately every two years. As this prediction proved correct, computer processor speeds increased exponentially over the past two decades in accordance with Moore's Law. Feng-hsiung Hsu, the principal designer of Deep Blue, wrote in his 2002 book Behind Deep Blue: Building the Computer that Defeated the World Chess Champion, "Computers can get better much faster than [Kasparov] can." Deep Blue beat Kasparov with the help of 480 specially made chess chips housed in 30 RS/6000 workstations. According to Mark Saylor of the Los Angeles Times, that enabled Deep Blue to consider "more [chess] positions in 10 seconds than Kasparov will think about in his lifetime." Hsu wrote that a small personal digital assistant such as the Compaq iPAQ in 2001 with just one smaller chess chip could probably beat Kasparov. The effects of Moore's Law are evident in many of our personal technologies. In 1997 people had just started to carry cell phones and pagers. Now, many cell phones are dubbed "smartphones," and some of us use smart watches. Computers imitate humans as virtual assistants named Siri, Cortana, Alexa, and Google Assistant. Some of them live in our houses like a friendly ghost—invisible but available at our beck and call. As a result of these adaptations, computers in all shapes and sizes have become integral parts of our lives in ways that people 20 years ago couldn't have imagined. When Newsweek wrote about the chess match in 1997, it listed three things that machines still had trouble with: flying, navigating, and teaming up. Navigating is a domain in which computers have made significant improvements. Many of us have a GPS-enabled device to help us navigate, whether it is a standalone device, one embedded in the car itself, or even our phones. Going even further, cars are starting to help us drive and, in some cases, they are even driving themselves. One of the earliest successful attempts at self-driving was Stanley, a modified Volkswagen Touareg. In 2005 Stanley competed in a race funded by the Defense Advanced Research Projects Agency (DARPA) in which the challenge was to have a vehicle autonomously drive a 132-mile off-road course. Stanley and four other cars completed the race. Their success was astonishing in comparison to a similar challenge held a year earlier, in which the furthest any vehicle traveled was a little over seven miles. Off-road vehicles such as Stanley served as stepping stones toward automated vehicles sharing the road with humans. Google started its self-driving project in 2009 with the eventual goal of allowing ordinary people to purchase and use these vehicles. Other car companies phased computer technology into their products, with some of them developing their own autonomous vehicles. As the technology continues to evolve, self-driving cars will have implications for traffic, city planning, and even how we travel. 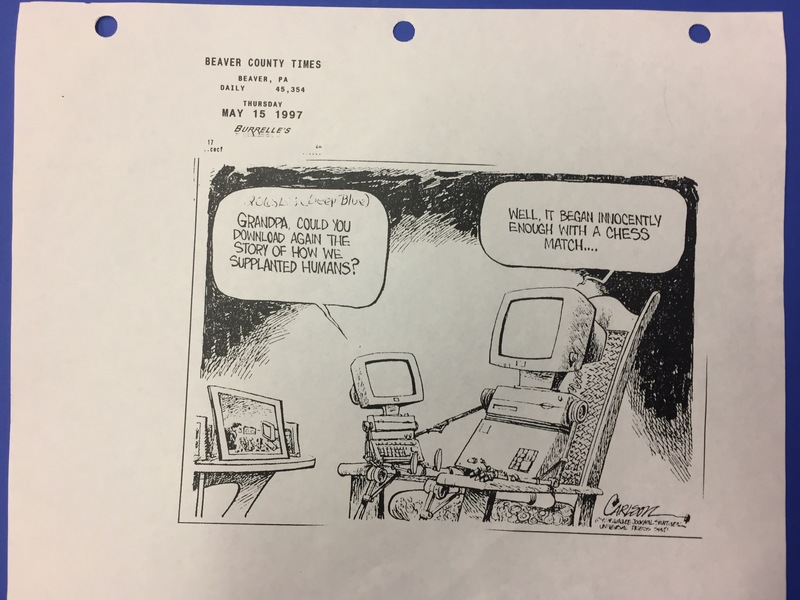 In the same 1997 Newsweek article, Garry's mother, Klara Kasparov, clearly stated what was at stake: "humans cannot relax until they are sure they have intellectual priority over the machines." Well, the next example does not bode well for the human race. Fast forward to 2011 when another IBM product, Watson, found itself competing in a contest more closely associated with intelligence: Jeopardy!. Watson squared off against the game show's two most successful players: Ken Jennings and Brad Rutter. Watson not only won, it amazed the television audience with the demonstration of its "thinking," which it adjusted as it learned the answers to the strings of questions. The machine's large margin of victory led Ken Jennings to jokingly write in his Final Jeopardy! answer: "I for one welcome our new computer overlords." Since its appearance on Jeopardy!, Watson has been assisting people by predicting the weatherand helping them with their taxes, among other applications. In contrast, a 1997 Wall Street Journal editorial proclaimed that "the creation of Deep Blue, in short, is a marvelous human achievement." As much as people fret about machine superiority, it is crucial to understand that these machines and algorithms did not create themselves. Hsu thought that the billing of "Man vs. Machine" should have been "Man as a performer vs. Man as a toolmaker." In the end, humanity won the match by creating a set of chips and algorithms that allowed Deep Blue to beat the world's best chess player. What really drove and navigated Stanley was a set of algorithms designed by a team at Stanford. Watson could be stuffed with terabytes of information but couldn't do anything with it without the algorithms produced by the IBM development team. Computers still elicit mistrust, angst, and anxiety among people who worry about cybersecurity threats, the consequences of computer mistakes, and even an emergent and independent artificial intelligence capable of slipping our control. It's natural to be anxious about a future you can't predict, and who knows what the next 20 years of technological developments will bring, but I for one am not ready to welcome our computer overlords anytime soon. Drew Robarge is a museum specialist in the Division of Medicine and Science. He does not need Deep Blue to remind him of his poor chess skills.